I was fresh out of architecture school and working on my first project as a designer. It was one week before our design Development Deadline. The project manager asked me to draw up a list of remaining design issues. I was fortunate to be working with an experienced project manager who, in addition to being extremely patient with me, saw it as her responsibility to mold and shape green architecture graduates into fully functioning architects. Not an easy task. . .
“So you’re telling me that designing custom coat hooks is as important as fine-tuning the proportions of the massing?” she asked with a raised eyebrow. “Well. . . I mean. . . no. Not when you put it that way. . .” I stammered. “So no custom coat hooks?” I asked incredulously. “OK, I understand. . . only the two most important things” I replied and headed back to my desk. So I quickly got over my wounded pride, rolled up my sleeves and got to work. The project didn’t win any design awards but the client was extremely happy with the results and hired us to do another project soon after. Though I didn’t know it at the time, this was my first introduction to the 80/20 rule. In 1896, an Italian economist named Vilfredo Pareto published a paper that showed 80% of the land in Italy was owned by 20% of the people. Pareto looked at other countries and found that this 80/20 distribution of wealth was extremely consistent. Fast forward to 1941. A management consultant by the name of Joseph Juran discovered Pareto’s research and applied it to quality issues. Much like Pareto, Juran found that the 80/20 distribution held true. In Juran’s case, he discovered that 80% of quality problems were caused by 20% of the issues. Juran called this phenomenon “the vital few and the trivial many”. It is also known as the Pareto Principle or the 80/20 rule. 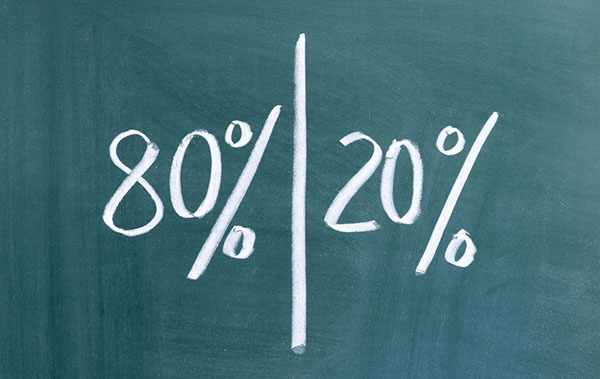 The 80/20 rule states that 80% of your results in any activity will come from just 20% of your effort. Essentially, there are certain actions you do (your 20%) that account for most of your success and happiness (your 80%). While the numbers aren’t always exactly 80/20, what’s important to understand is the lopsided ratio of effort to results. So how do we apply this to architecture and design? Take a look at your own work and see if you can identify an 80/20 distribution of results to effort. For example, in a given day, 80% of your work is probably completed in just 20% of the time. Or 80% of your design time is spent on just 20% of the building. If 80% of your firm’s work comes from 20% of your clients then cultivate those relationships. If 80% of RFIs come from 20% of the building then focus your documentation on those areas. If 80% of your marketing photographs are taken in 20% of the building then apply more design effort to these areas. The trick with the 80/20 rule is identifying the 20% that really matters and focusing on those areas because they are the ones that drive your results. In my case, it was my project manager who helped me identify the 2 design issues out of the 10 on my list that would bring the most impact to the project. It’s easy to get caught up in the minutia of our various tasks and lose sight of what really matters. Likewise, it’s easy to treat all the tasks on your list as having equal importance. Don’t fall for the hard work paradox. Instead, take a critical look at what you’re doing and focus relentlessly on those few things that really matter. Do this and you’ll super-charge your productivity. How about you? Do you see the 80/20 rule at play in your work? How do you identify the 20% that brings the most value to you, your work, and your firm? Leave a comment below! I remember one of my mentors used to tell me “Jeff, sometimes you get so deep in the forest, that you can’t see the trees.” He told me that the 3 most important things your building needs to do are: 1. Fight Gravity 2. Keep water out and 3. Design for the program, the rest as he said is just “fluff”. This obviously oversimplifies our profession and architecture as a whole, but still a very valid point. What good is a great looking building that leaks? Great points Jeffrey! Sometimes a simple 3-part rule is just what you need to pull back and look at the big picture. Very useful post, Michael. Great writing too, love the opening. Good tip. I’ll try to remember this the next time a get cought up in less importante details. 1. Revit Families – 80% is the Graphics (no surprises there) , & the 20% I would say are the Parameters to make the Families behave in the correct manner, as needed by the clients. 2. Revit (Startup) Project Template – 80% is again Graphics and the general set up of Views & Sheets. The 20% would be establishing the “Office Revit Workflow”, setting up schedules, project (and office) parameters and gathering all the client’s comments on what and how their Revit Template needs to work to make their firm “Work Smarter not Harder”. I WAS killing myself and not satisfied with the results. Since that day, I changed my approach to ANY task, and not only I have been working much faster and with great pleasure, but also achieving much better results, in every way. Later I started studying about the Pareto Principle, ABC and related ideas. Today I am a Project Manager and sometimes present lectures, and I use every chance I have to help other people learn these ideas, because I believe they are so useful, and not just for a bunch of tasks or budget analysis, but most of all, for your priorities in LIFE. I am SO grateful to this teacher, he really made me a happier person and a better architect! Hope you can do the same for other people. Great post! So true! I wrote this post mostly as a reminder to myself to simplify and focus. I shouldn’t try to do everything, otherwise, like you say, it will all be mediocre. Thanks for sharing Patricia. I love this post! Sometimes it drives me crazy when designers want every single little piece of the project to be the custom coat hooks – when they haven’t made major functional decisions and are already running behind program and over on fees too! Thanks Ceilidh! As I mention in the post, I’ve been guilty of custom coat hooks in the past. I’ve since found the 80-20 rule really helpful when I start heading into the weeds. Space Eco literacy defined as an ability due to cognize measurable adverse effects on life supports, property, comforts, human values , aesthetic and personal space preservation, due to a deliberate or accidental action. The article How to work Smatter with the 80 -20 Rules is worth practising. Prof V Jagannatha QMS/EMS Auditor, Trainer.